A natural moisturiser without artificial fragrances and colours. The s17 Total Regenerating Moisturiser promotes healthier skin and a glowing complexion. This highly effective emollient is especially formulated with natural antioxidant ingredients of: squalane, green tea, cucumber, red seaweed, soybean, willow herb, vitamin E, alpine flax and lemon myrtle to nourish, soothe and regenerate the skin. The regular use of the moisturiser can help to prevent premature ageing and promote a more youthful appearance. 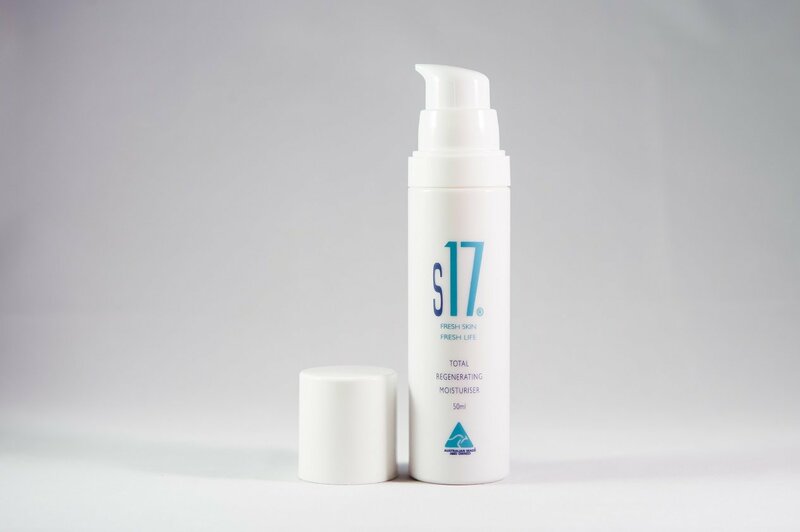 The s17 Total Regenerating Moisturiser is 100% formulated and made in Australia without artificial fragrances and colours, and is suitable for sensitive skin. I am on my second bottle of this wonderful moisturizer. My skin is smooth and supple and just this week someone commented on how good my skin was and asked me what skincare I wad using. Couldnt recommend this product highly enough! I have recently started using the s17 moisturiser and am already loving it! After two weeks of using it I noticed my skin was visibly smoother and more hydrated. I would highly recommend this product to anyone wanting to achieve a healthy and glowing complexion! The s17 regenerating moisturiser smells amazing and makes my skin feel amazing and soft. 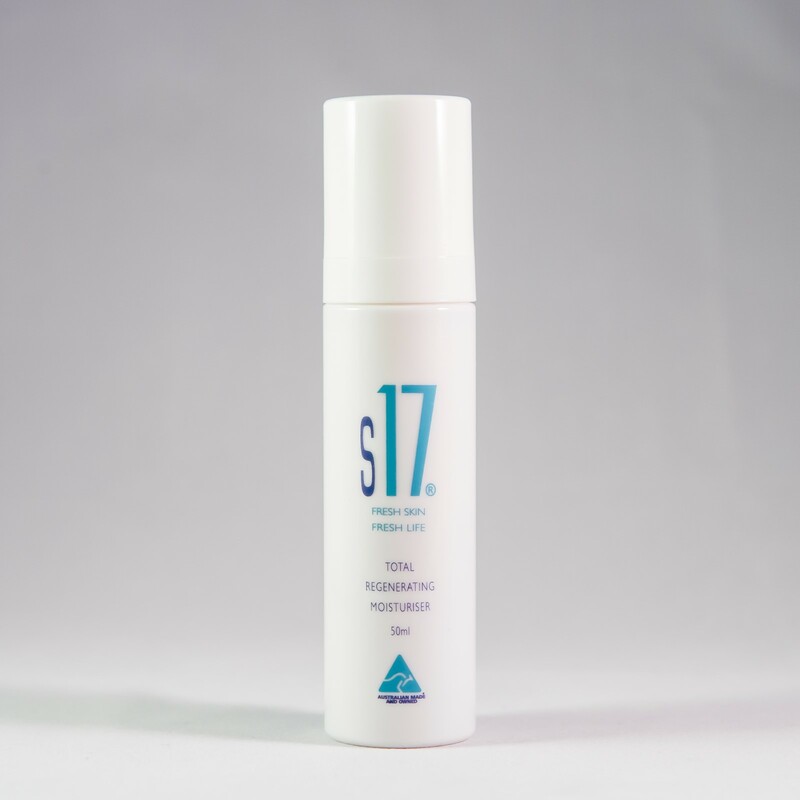 Unlike some other moisturisers, s17 doesn't clog up my face and it feels light on the skin. The results so far have been amazing and have reduced redness on my face. After only a month my skin looks great using the S17 moisturiser. I love the texture and fresh smell of the cream. It is light and easy to apply. I will definitely be buying it again! It smells really fresh and is very soothing and moisturising! Takes a minute to settle into my skin but then my skin feels nice and fresh! I use it every day! I have been using s17 moisturiser for 4 weeks and love it! After only 2 weeks I saw a noticeable reduction in lines and wrinkles. This has improved even more over time and my friends say I look 10 years younger :) s17 hydrates my skin much better than other products I have used. I enjoy the lemon scent and it makes me feel fresh all day. I also have sensitive skin and s17 has not caused any irritation and I find it very soothing. Great Aussie product I highly recommend!! With S17 products I look younger and my skin is softer and hydrated. I love the lemon myrtle scent and it's wonderful having all Australian made products. The cleanser and moisture lotion are worth every scent. Fine lines are gone and deep lines are reduced. A winning product. Thanks. The s17 Total Regenerating Moisturiser is very soothing and it is suitable for sensitive and acne-prone skin. I used this only in the evening as an overnight moisturiser as my skin gets quite oily during the day. It worked very well to soothe redness and irritation caused by breakouts and made a noticeable difference in just days! There is also a very unique but pleasant lemon myrtle scent, which doesn't cause irritation on sensitive skin. helps the skin retain water thus increasing hydration. 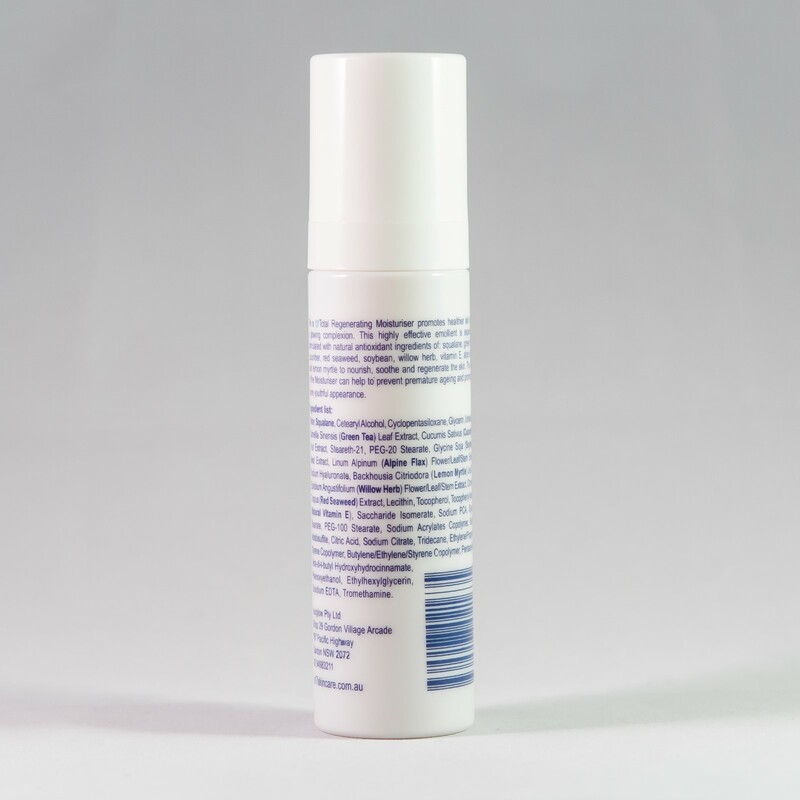 has pronounced moisturising effects and reduces skin roughness. acts as a natural analgesic, mimics hydrocortisone to sooth discomfort. acts as lubricants on the skin surface and gives the skin a soft, smooth appearance. reduces cellular damage caused by UV radiation. strengthens the skin’s natural barrier thus keeping it healthy and hydrated. Water, Squalane, Cetearyl Alcohol, Cyclopentasiloxane, Glycerin, Undecane, Camellia Sinensis (Green Tea) Leaf Extract, Cucumis Sativus (Cucumber) Fruit Extract, Steareth-21, PEG-20 Stearate, Glycine Soja (Soybean) Seed Extract, Linum Alpinum (Alpine Flax) Flower/Leaf/Stem Extract, Sodium Hyaluronate, Backhousia Citriodora (Lemon Myrtle) Leaf Oil, Epilobium Angustifolium (Willow Herb) Flower/Leaf/Stem Extract, Chondrus Crispus (Red Seaweed) Extract, Lecithin, Tocopherol, Tocopheryl Acetate (Natural Vitamin E), Saccharide Isomerate, Sodium PCA, Glyceryl Stearate, PEG-100 Stearate, Sodium Acrylates Copolymer, Sodium Metabisulfte, Citric Acid, Sodium Citrate, Tridecane, Ethylene/Propylene/Styrene Copolymer, Butylene/Ethylene/Styrene Copolymer, Pentaerythrityl Tetra-di-t-butyl Hydroxyhydrocinnamate, Phenoxyethanol, Ethylhexylglycerin, Disodium EDTA, Tromethamine. Nothing came out after I pumped the airless bottle a couple of times. Is the bottle defective? gently tap the top of the bottle against a surface. Copyright s17 Skin Care. All Rights Reserved.